Does the Game of Thrones Season 7 Trailer Hint at a Major Death? 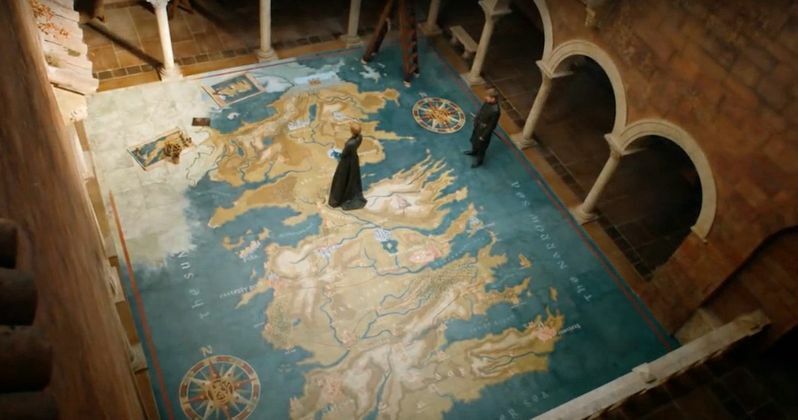 Last week, HBO finally unveiled the full Game of Thrones Season 7 trailer, which featured an interesting shot of Cersei Lannister (Lena Headey) and Jamie Lannister (Nikolaj Coster-Waldau) standing on a large map of Westeros, with Cersei telling her brother that that she will destroy all of her enemies. While this brief shot certainly didn't show Cersei or her brother/former love Jamie Lannister in any direct danger, many think that this shot, when coupled with a scene from the Season 5 premiere, could ultimately be foreshadowing the death of a major character. If you aren't caught up with Game of Thrones yet, there will be major SPOILERS below, so read on at your own risk. The folks over at Vanity Fair have come up with an interesting theory, which claims that this cryptic shot could hint that the death of Cersei Lannister may be imminent. While the shot is quite brief, the site noticed that Cersei is standing on the part of Westeros that is known as The Neck, an area of swampland where Meera (Ellie Kendrick) and Jojen Reed (Thomas Brodie Sangster) hail from. This shot also shows Jamie Lannister is standing near an area known as The Fingers, a series of peninsulas that jut out of the mainland, where Petyr "Littlefinger" Baelish (Aidan Gillen) hails from. While these visual clues may still be innocuous, when coupled with a scene from the books, it's much more intriguing. The Season 5 premiere showed part of a scene from the books, where a young Cersei Lannister gets her future told from a fortune teller in the woods known as Maggy. That scene in the TV show revealed that all of Cersei's children will die before her, which actually did happen after her last surviving child, King Tommen (Dean-Charles Chapman) took his own life after Cersei used the wildfire under the Sept of Baelor to kill the High Sparrow (Jonathan Pryce), Queen Margaery (Natalie Dormer) and many more of her enemies. However, in the George R.R. Martin book, the fortune teller also reveals that, "when your tears have drowned you, the valonqar shall wrap his hands about your pale white throat and choke the life from you." "Valonqar," in High Valyrian, translates to "little brother," which could mean that Jamie may actually strangle his sister with his own bare hands, teased by Jamie standing on The Fingers and Cersei standing on The Neck in this shot. While it would be more logical for Cersei's other little brother, Tyrion Lannister (Peter Dinklage) to choke his big sister, since both siblings truly hate each other, Jamie is still technically the "little brother," since Cersei exited her mother's womb just before her twin brother Jamie. It would certainly be more interesting from a narrative standpoint for Jamie, not Tyrion Lannister, to kill his sister and former lover, especially since they have started to grow apart in the past few seasons. Jamie spent the back half of Season 6 in Riverrun, after it was captured by Blackfish (Clive Russell) and the Tully's. When Jamie returns to King's Landing, Cersei has just been crowed the new Queen of Westeros, taking her seat on the Iron Throne after King Tommen's suicide. Of course, this theory has not been confirmed, but it's quite clear from the trailer that this season will mark the beginning of The Great War, which was teased in the Season 6 finale, with all of the main characters finally converging on Westeros. Daenerys Targaryen (Emilia Clarke) was seen setting sail for Westeros aboard her massive fleet, while Jon Snow (Kit Harington) was named the new King of the North as Cersei took the Iron Throne. There have also been hints at a long-awaited Stark family reunion, with Sansa (Sophie Turner) and Jon Snow taking back Winterfell, Arya returning to Westeros to kill Walder Frey (David Bradley) after spending the past two seasons in Braavos, and Bran Stark (Isaac Hempstead Wright) being lead to The Wall by Benjen Stark (Joseph Mawle), which could set up all of these characters reuniting in Winterfell at some point this season. All we know for sure is that Game of Thrones Season 7 debuts Sunday, July 16 at 9 PM ET on HBO, but hopefully we'll learn much more about this season between now and then.